Orders must be placed by 2:00 PM EST for Next Day Shipping. Please be sure to select Next Day Air from the shipping options in your CART. You can trust that your order will be quickly processed and safely delivered. We ship your order using UPS from one of our 4 warehouse locations closest to you to assure that your order is in transit the shortest time possible. When you place an order we will estimate the total shipping costs based on the estimated gross weight, your shipment destination based on your Zip Code and the shipping method selected - UPS GROUND or NEXT DAY AIR. Final shipping charges will be reflected on your credit card statement. Providing every customer with a quick and easy online shopping experience. 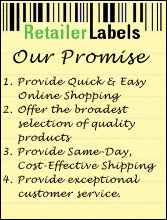 Offering the broadest selection of quality retailer labelers and labeling supplies for all retail applications. Providing same-day* and cost-effective shipping from our warehouses located all across the country. Providing knowledgeable sales consultants ready to exceed your expectations in customer service.